Category 5e 110 Patch Cords exceed performance specifications as defined in ANSI/CEA S–90–661–2006 & eliminate the hassle of punching down your conductors into the punch down block since the ends are already terminated. Used for telecom applications from 110 to RJ45 connections. Tested up to 350MHz. Patch cords are available with four-pair 110 plugs and are used for patching between category 5 & 110 termination fields. Category 5 RJ-45/110 Patch Cords are available in four-pair configurations wired to T568B wiring scheme. 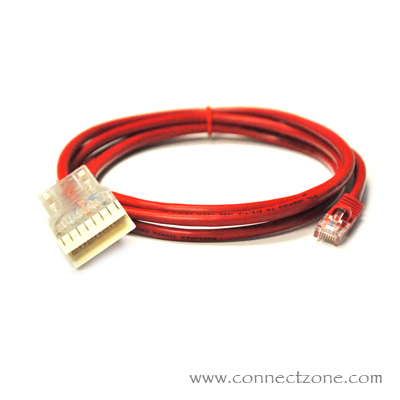 RJ-45/110 Patch Cords are used for patching between equipment and cat 5 110 termination fields. All cords are 100% factory performance tested. Custom Cat5e Ethernet patch cables with 110 connector on one end and RJ45 male plug on the other. Our Cat5e cables consist of 4 unshielded twisted pair, 24 AWG stranded conductor with PVC jacket. These 110 Cat5e network cables are commonly used on 110 blocks. ConnectZone can create custom lengths to customer spec upon request.